Now that the weather has warmed up and the grill has once again taken up residence on the patio, I've been a grilling fool. I'm sure everybody has their own "go to" foods for the grill. Ours are chops, brats, hot dogs, chicken breast, corn on the cob, beef burgers and marinated skirt steak (for tacos). On special occasions I actually get a nice thick steak. 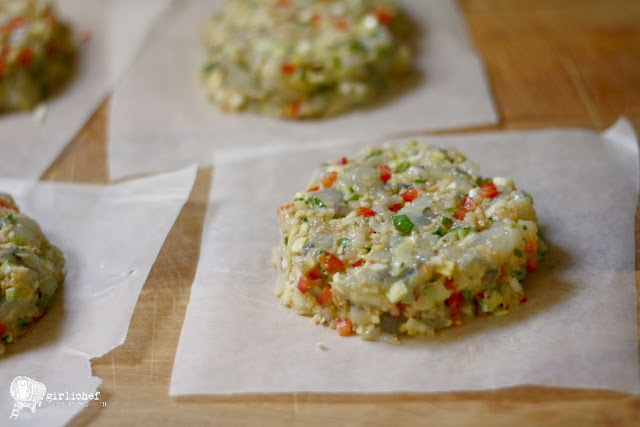 But what I really look forward to is that familiar smokiness permeating some fish or seafood. I have pescetarian tendencies, but my family does not. Each of them likes certain types of fish or seafood, but would revolt if I tried to completely remove other meat permanently from their diets. So instead, I just slip some in as often as possible. A few days ago, I picked up some beautiful raw shrimp at the market that was just screaming for the grill. I entertained the thought of lining it up on a skewer with some veggies, but since I also had some ground beef, I thought maybe it'd be fun to have a surf-and-turf burger option for dinner that night. Since the shrimp was so pretty, I wanted to take advantage of it by leaving some larger chunks that you could see when you bit into the burger. The larger pieces make the burgers a bit more delicate to handle, but I thought it was worth it. If you don't want to deal with that, simply pulse the shrimp in a food processor to make a bit more of a paste instead of using a knife. 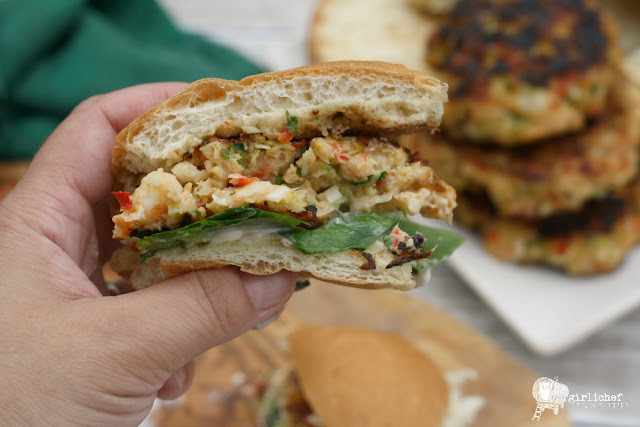 I was so pleased by the bold flavors of these shrimp burgers, but even more pleased that my family all reached for a one before they reached for a familiar beef burger that night. Those pescetarian tendencies of mine must be rubbing off on them—at least a little bit. 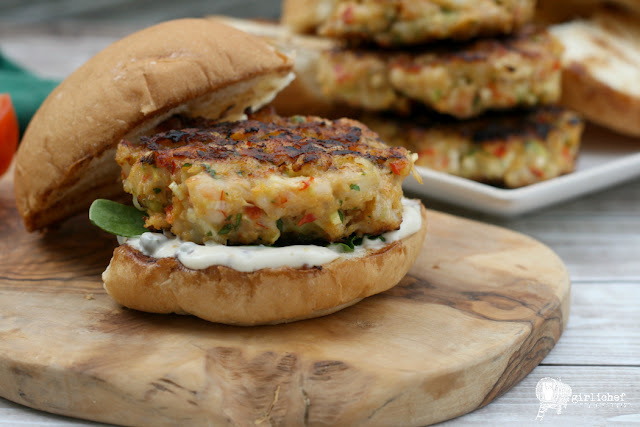 See my original Shrimp Burgers post at Food Fanatic. 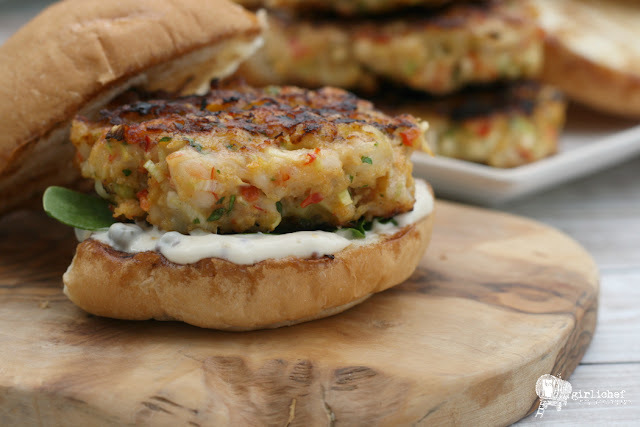 See the Shrimp Burgers recipe at Food Fanatic.